Disclaimer: The Campfire Audio Comet was sent to us a sample in exchange for our honest opinion and does not have to be returned. We thank the team at Campfire Audio for giving us this opportunity. The launch of the Comet actually took me by surprise. I was not expecting both the form factor and the $199 price point. Up until this point, the Orion was the go-to single BA IEM price at a much higher $399 and followed the house design of the Andromeda, the now discontinued Nova and the recently launched Polaris. I thought we were done, complete, all-in. I guess not! 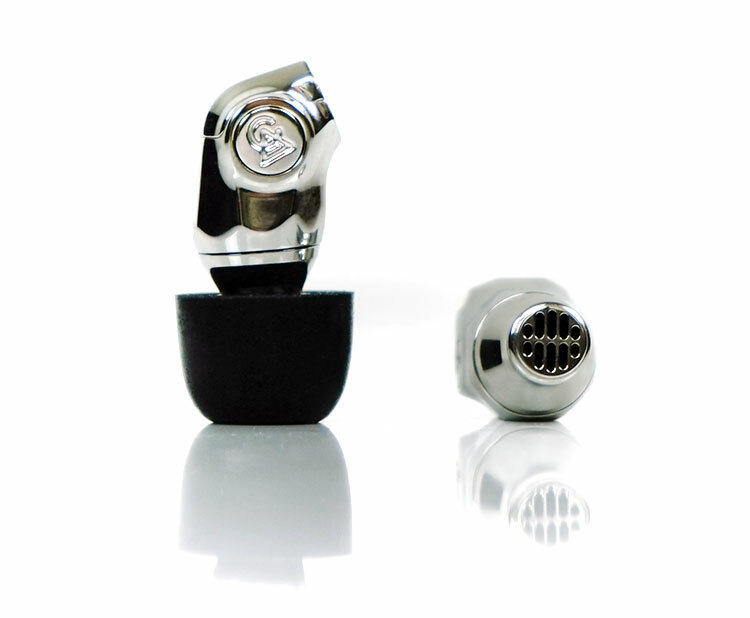 There has been a spate of single BA IEMs hitting the market in the last year. All priced competitively to the Orion and doing quite well. The qdc Neptune at $198 is a classic example of entry-level BA’s for not so much and pushing out a great performance. It seems only logical Campfire Audio would look at that price segment and come out with something they think can compete at a value-oriented price point. This also seems to be an opportunity to try out something very new. You may have noticed that their high-level Atlas sports a very similar design so I am expecting this new look to CA IEM’s to be an ongoing theme. Campfire Audio is pitching the Comet as their most competitive priced IEM yet to feature their 3D modeled Tuned Acoustic Expansion Chamber system. This is their tubeless acoustic chamber designed to basically let the treble breathe more than any tube system you get with traditional BA designs. You heard it first on the Andromeda and it is being currently being used on the Polaris also. Single BA designs are often known to be all about the mids because it is tricky to get a single BA to competently cover the entire frequency range. Usually, there is a degree of roll-off on one end or the other, or both. Campfire’s pitch is that this is not going to happen, or at least as much, with the Comet. You should get better treble clarity as a result. A complete break from the old designs, the Comet looks like nothing I have seen before at this price level for a single BA. Quite apart from the unique looks CA is pitching this as being highly durable, an all-around better fit as well as being more flexible in wearing it straight-up or over-the-ear and still getting a good seal. I have seen some very unusual designs of late and the Comet is definitely in that category of “Say whattt?”. CA are also pitching a 3-button control cable and mic on the same cable design they used for the $599 Polaris. I believe this is the first one they have done and at $199 I can see why as it starts to appeal to the more casual consumer market who might want to plug and play into their smartphones while on the go. The final message is on the technical side with the use of a larger vented balanced armature design. These bigger BA units tend to perform much better with low-end response than previous smaller units used in old single designs. CA believe that as a result the Comet low-end will hit a little harder and display less roll-off than before. Combine this with the T.A.E.C. system the pitch is for a full-range performance and not just the mids. It is a look that launched a ton of Han Solo hairdryer memes knocking around FB, Campfire sure knows how to make something memorable. 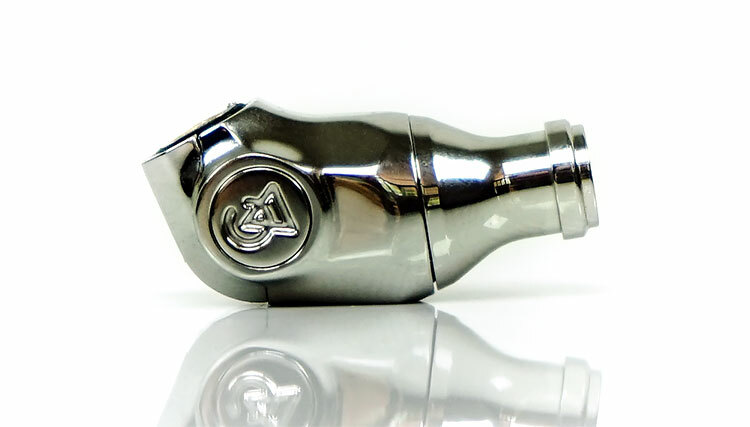 The Comet completely ditches the curved PVD finish of the 2nd gen liquid metal alloy designs as well as the original edged bulkier machined aluminum of the Andromeda and Jupiter. Instead, the Comet is constructed from drop-forged stainless steel which is then CNC machined and polished to the point where you can pretty much see your own soul in the reflection. Little CA branded motifs on each side neatly adorn each side just below the MMCX connectors. This is one seriously solid 3-piece driver shell construction and any concerns about chips, flaking or cracks seem, for the moment, put to rest. 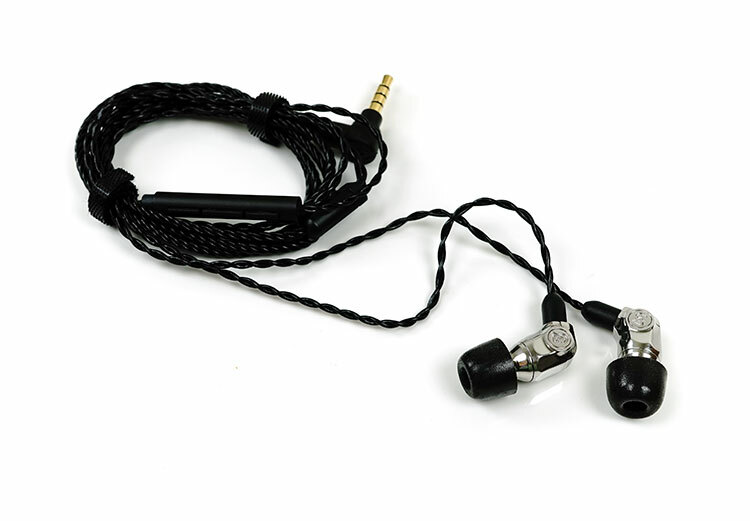 The Comet shape is elongated rather than bulky taking its cue from the bullet-shaped IEM design principle. Here, the emphasis on the tip creating the best seal. The rest of the body sort of gets out of the way so you are not fiddling for comfort. Campfire Audio, however, has tweaked that core design to curve it slightly in a downwards motion. This means less strain on the cable and an initial nudge to wear the Comet straight down as opposed to over your ear. That being said, you can wear it over your ear with slightly improved noise levels from the cable but it does feel a touch more natural straight down. The front third of the Comet is really the dome and nozzle of the Comet. It is about 1/3 of the entire body length but seamlessly integrated into the main body. The final diminution of width in the barrel only happens on the final 5mm. There is a very generous and refined lip for holding the tips. Almost too generous to be honest so watch taking off foam tips you do not break them in the process because it locks them solidly in place. The driver bodies on the Comet are not marked meaning they are channel agnostic. The left and right markings are on the detachable cable MMCX connectors. Campfire has continued with the beryllium plated MMCX connectors on the Comet, first used way back on the Lyra a few years ago. They are pretty durable and a welcome addition for cable rollers worried about the connectors breaking from multiple change-overs. 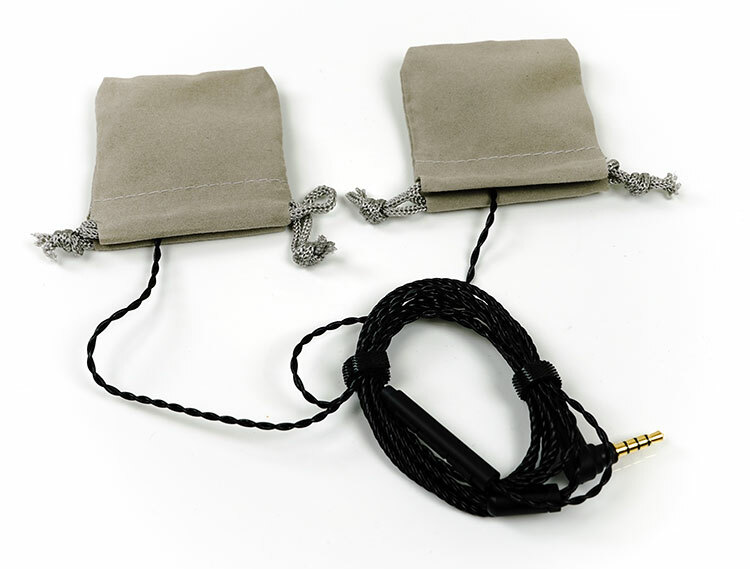 The cable itself is the same 1.2m black twisted copper Litz from the Polaris model only this time featuring an inline 3-button control with mic for use smartphone or voice-based integration. It is terminated with a durable right angle rubberized 3.5mm 4-pole gold-plated jack. Given the intention is to use the Comet in a straight-down fitting gone also is the memory wire of the Polaris version of the cable. You can still wind it up around your ear though, the wire has plenty of pliancy to curve and stays reasonably well in place. One thing to note is this is a quiet cable with little or noise traveling up from knocks or bumps. It is slightly quieter over the ear than straight down as you would expect but the difference is not huge. There is a design flaw in the cable is and that is the cinch positioning. The new inline module blocks it from sliding all the way to the top. Not sure what happened there, feels like someone forgot to make an adjustment. Guess what though, it is the same problem on the qdc Neptune so it is not alone. I would look at those detachable type of cinches that allow the cinch to bypass the wire with the module on it and reattach above again. Everything comes down to the tip you use because the Comet itself is designed to “get out of the way” in terms of fitting. The slimline design means it will not cover any aspect of your outer ear so tip fitting is crucial. That should be good news in theory because there will be no pressure issues or potential edges digging into your ear. CA have taken the “what if” out of the design and kept it well away from concerns like that. As a result, it is a pretty comfy fit. My tendency is to shoot for the foam tips before anything else and true enough they will give you the best seal out of them all. It will darken the tone and warm the bass up a touch, some will like that but if you do not then the SPINFIT tips are good alternative and do not veil the Comets performance. Since this is a BA design you will not find any bass ports or external venting holes so combined with a foam you get excellent levels of isolation and background noise attenuation with the Comet. The packaging dimensions and purposing is the same as the rest of the range. I am also glad to see inside CA has not cut any corners with the accessory line-up. That minimalist cardboard box has served them well. I bet it cuts down significantly on logistics costs for deliveries. The graphics and artwork have changed. It is less psychedelic, less astronomy based and more product-centered with the Comet itself on the front. Inside you will find the tried and tested “pimped” or fur-lined semi-stiffened black zippered leather carry case which I just love. It is probably one of the nicest IEM carry cases out there right now and glad to see it was not sacrificed to get down to that $199 price-point. The Comets also comes in the same wrap bag style of the Vega. This is designed to protect the IEM housing from knocking together during transport and perhaps damaging them unintentionally. 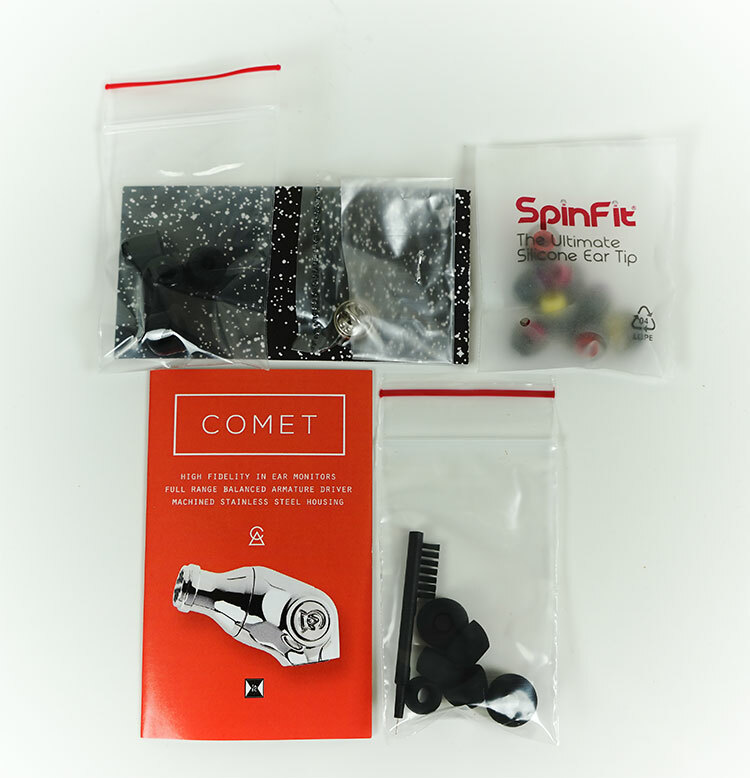 The Comet also comes with a cleaning tool, CA branded pin and a short user guide. It was a different reviewer for that one but I am told it is quite neutral sounding. Thanks so much for your advice ! On a side note, I’ve seen you have reviewed the er4xr before. May I know the differences between the er4xr and the FiiO fh5? Oh FH5 is more evolved for sure, but then it is more expensive. The FH5 is a hybrid so it for me its quite warm but with good vocal presence. The Comet is coherent but is more dipped in the mids and more about the low and top-end performance. Hi there! How would you compare this model to the fiio fh5? May i know which would you recommend to buy ? Thanks! Sounds like you didn’t get a great seal as they are much bassier than a lot of other single BA’s out there. I wear them over the ear also. I’ve had these for a few days. Bought them based on the great reviews I’ve read. I have buyers remorse. The lack of bass makes these sound like $20 cheap ear buds. Haven’t found them to have the greatest seal either. Fall out easily with motion. There is way better sound out there for 200. Actually that should be a pretty good combo come to think of it though personally not tried it yet. I listen to a lot of 80s and 90s hip hop, which would you recommend between the Comet and Haka? Or would another iem between that $200-400 range be a better fit? Single BA really intrigues me. I had an iBasso IT01, but after it breaking twice, I’m looking to get something different. Thanks! If the low-end is more important than vocal then the Haka. The comet low-end is excellent, but just a shade lighter than the Haka. Vocals and high end of the Comet are more extended. Haka is a little darker in that respect. Can you compare it with fiio f9 pro?